Conclusions: where do we go from here? The subject of energetics or energy economics is study of energy under transformation. Energy flows at all levels and scales, from quantum level to biosphere and cosmos. Energetics is a very broad discipline encompassing thermodynamics, biology, chemistry, biochemistry, ecology etc. Since energy flows under transformation, the principles of energetics follow the four laws of thermodynamics. The authors of this book have had sound background in energetics. 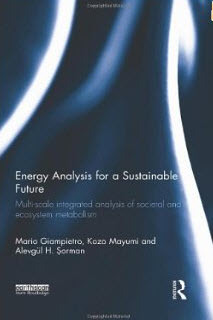 Mario Giampietro’s interest in energetics was kindled by lectures of Prof. Gino Parolini in 1978 and has tried to develop an integrated and holistic approach to energy analysis based on Prof. Parolini’s suggestions at the University of La Sapienza in Rome, whereas Kozo Mayumi’s interest in energetics was generated by Atsushi Tsuchida the founder of Japanese Entropy School. This book is about energy accounting. Energy can be measured using different units such as joules, kWh, kcal, Btu or quads. The problem starts when we try to account or integrate involving aggregation of different types of energy forms. The authors emphasize that a single method of accounting of energy in terms of joules would be unrealistic since energy has different scales and domains that are non-equivalent due to different forms and scales of energy since data generated within non-equivalent processes cannot be summed up even if expressed in the same unit. The quantitative assessment of aggregation at the national level cannot be useful for decision making or prioritizing the sources particularly when several alternative sources of energy are available. Context is important when equivalence is being considered since a kilogram of apples and a kilogram of oranges in weight are not equivalent in as far as vitamin C or price is concerned. So they cannot be aggregated on the basis of weight. As one can infer from the table of contents the book is organized in two parts. The first part of the book deals with the definition of the problem. And the second part deals with the approach used for the solution of the problem. seem particularly impressed by our achievement nor by the chosen subject of investigation”.